Whilst it would be easy to say this is just another example of the exquisite mechanisms made in Vienna in the mid to late 1800’s, but that would not be the entire story. Most mechanisms from this period looked amazingly alike – the guilds and the masters kept their life easy by making things pretty darned similar – which, in part explains how they kept on making excellent mechanisms. But, once in a while I come across a mechanism that exhibits the maker’s individuality. 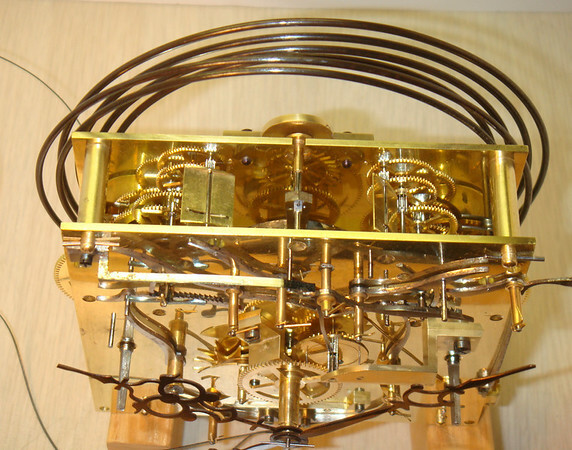 Or, hey, this mechanism does not have anything on the dial – perhaps it is in fact a provincial mechanism? The parts are very well made – as is fitting for the genre. What is unusual is the arrangement of the two springs that move the two strike racks – note them to the bottom of the front plate – they form a curve from one side to the other, and even use the same hole for the tails of both springs. Small – yet just never seen it before. The second unusual detail is the way the maker chose to locate the strike fans on their arbors – instead of using a groove all the way around the arbor to locate the spring that holds the fans in place; the maker used just a filed “V” notch on one side of the arbor. When I first saw this it gave me a moment’s pause – in as much as the concept for the groove is that the fan can continue to spin after the train stops – to help minimize the inertia of the fan damaging the teeth in the gears between the gathering pallet and the fan arbor. But, thinking about it, the fans are pretty darned light – and, inspecting the gears and pinions – no apparent unusual wear. So, I accepted the makers design when restoring this mechanism and just noted that the maker was someone who was not afraid of doing things a little differently!